The first thing that impressed me about Celestine was her number of interests, ranging from mastering languages to the great outdoors. The second thing was her determination to take advantage of all the opportunities that came her way. This is HUGE. I just read the brilliant Herminia Ibarra's article "Women Rising: The Unseen Barriers" about how leadership experience creates leadership identity. 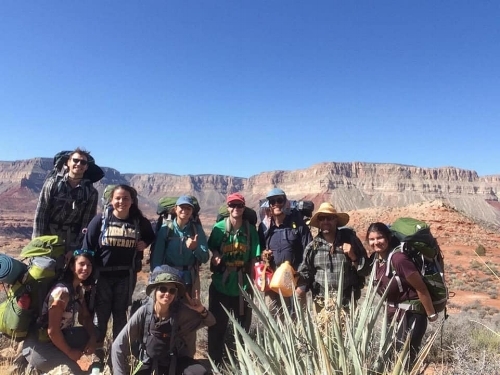 The way to become a leader is to do leadership stuff, just like how Celestine co-led a wilderness expedition with her class. Not only does action help you see yourself as a leader, but others start to see you that way, too. Nature might not be your thing, but if Celestine's experience of learning alongside others inspires you, consider Finding Your Tribe. A "tribe" unites people from different backgrounds around a common interest. A strong tribe connects you to people who are already rooted in the field, so you can benefit from their advice on getting started, getting ahead, and what to expect on the road ahead. Break time: No camera can capture the true golden color of that canyon wall that stood before us. But never mind that, let’s learn how to read a topographic map and find out where we’re going! What have you done recently to explore a career interest? I recently took a leadership class that was required for my Parks and Recreation Management degree, with an emphasis in Outdoor Education and Leadership. 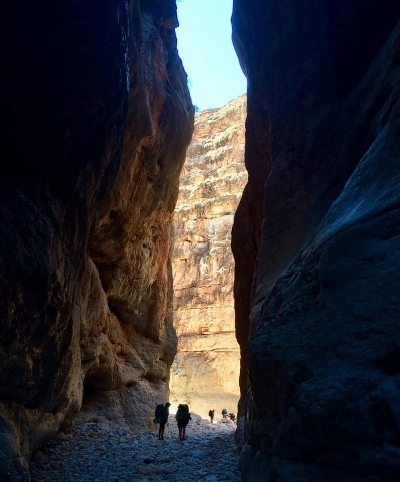 Through that class, I had the opportunity to go backpacking for six days in the Kanab Creek Wilderness. I went into the trip not knowing what to expect and being fairly confident in my leadership skills. I got to put these skills to the test for two days during this trip. It was a great setting to get helpful feedback from the group and my professor. I learned that I need to have a stronger voice in my leadership. Previous to this trip, I would have felt too rude to interrupt the group’s conversation and get us all on task. Now I know that as a leader, it’s my job to speak louder and make sure we’re accomplishing our goals. I have to work on being louder and prouder in my voice. There were also some things that I did well on the trip. I was recognized as very compassionate, patient, and communicative. So although we may not have stayed on task as much we needed, at least I made sure everyone’s needs were being met, whether it be taking it slow and helping people climb down a dangerous part of the trail, or taking the time to listen to someone if they were having a bad day. I learned a lot about my own leadership style and observed other peoples’ styles. Now I know where I need to improve as well as what I need to continue doing. Look for the big green back back on the bottom left. There she is! Best moment from this experience? What I loved about being a leader on this trip was my ability to teach others and problem solve. Beyond the leadership aspect, this trip was a good reminder of how simple life can be. Whether you’re teaching a friend how to climb up a rock, sharing a moment of admiration for the natural surrounding beauty, or eating peanut m&m’s, I was reminded that I can find happiness and reward in the little things in life. Now, I know that sharing the outdoors with others is my calling. I plan on finishing my degree and one day working in wilderness therapy.